I started riding around the age of 14. I rode on the back of my Dad’s Honda until he bought me my own Yamaha 125 Enduro which I rode on and off the road and through high school and college. Then I got married, sold the bike, had kids, and got divorced in 1989. In 2000, I was diagnosed with malignant melanoma and was given a 75% chance of survival over 5 years. When those 5 years were up and I knew my 2 boys would be OK on their own, I decided that it was time to get back in the saddle again and continue my passion of riding. The cancer experience also gave me a deeper appreciation of living life to the fullest! I bought a Harley-Davidson Sportster, but only had it a few months when I found my 2001 Dyna Wide Glide in April, 2005, with only 8,000 miles on it! 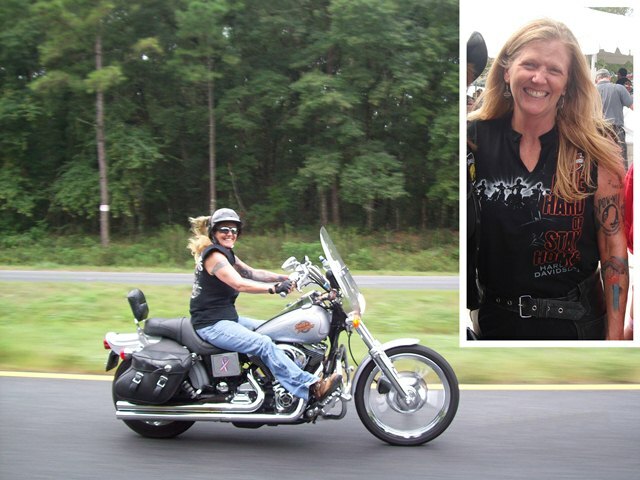 As a cancer survivor, I immediately joined the Chrome Divas, a ladies only motorcycle group which supports many charitable causes. I was Director of the Chrome Divas of Tallahassee from 2006-2008. I am also a proud member of the Patriot Guard Riders and Motor Maids and joined our local Harley Owners Group (HOG) in early 2006. I served for two years as Lead Road Captain for the HOG and am currently in my second year as Activities Director. I met Jack Powis and learned of his Long Distance Riders group in 2007 when I had the honor of riding my first Easy Rider 500 Mile Ride with Jack and other HOG members. I have completed many more Easy Rider 500 Mile Rides, but hope to complete some of the longer, more difficult long distance rides in the future. I have ridden in 26 of the lower 48 U.S. states and Mexico and my odometer recently rolled over 90,000 miles … 82,000 of my own miles in 6 years! I truly love riding and enjoy “sharing my spark” for riding with others as well as participating in as many charity poker runs and riding events as I can!